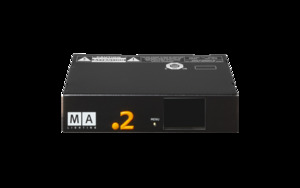 The dot2 Node4 (1K) connects to a dot2 console or dot2 onPC software via a Plug & Play network connection. The user can easily choose output configuration 1-4 or 5-8 from the dot2 software set-up screen. The dot2 Node4 (1K) does not increase the channel capacity of an dot2 console, which is limited to 4,096 channels. Additionally the dot2 onPC software can output up to 1,024 channels of DMX when connected to an dot2 Node4 (1K)! Normal network rules apply allowing nodes to be placed remotely.